Although Edwin Smith made a name for himself as a photographer and writers as diverse as Sir John Betjeman, John Piper and Cecil Beaton praised him as “a genius at photography”, “a great artist” and “an understanding and loving connoisseur of his subject”, he became a photographer by chance not choice. Trained as an architect, he thought of himself as a painter: it was only in the last year of his life, when lecturing at Bristol, that he wryly admitted to being a photographer. 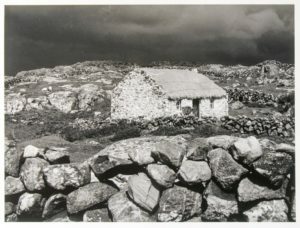 It was because he did not wish to feel wholly committed to the camera that he refused to install running water in his darkroom until 1967, made do with an antiquated enlarger and only acquired a relatively modern camera, a second-hand Linhof, in 1970. His favourite camera throughout his career was a massive mahogany and brass half-plate veteran of 1904 called the Ruby. It accompanied him on all his travels even after pressure of work had compelled him to resort to more easily portable equipment, hand cameras of the bellows type, at least twenty years behind the times. Chance plays a major part in all our lives, but seldom so conspicuously as in Edwin’s, perhaps because his guiding principles in both art and life—“Bend with the stream” and “Co-operate with the inevitable”—offered little resistance to the whims of fortune. Passionately concerned with every form of visual expression, Edwin was struck by some reproductions of the work of Atget which he saw in the library of the northern Polytechnic in Holloway, where he was a pupil. He decided to get a camera. It was a simple Box Brownie acquired with coupons given away with packets of cornflakes. Despite its limitations Edwin was intrigued by the medium and a year or two later his interest was encouraged by a friend’s gift of a quarter-plate camera. It was old and defective and while putting it in order Edwin learned a lot about its possibilities. With it he took some close-ups of ferns, dog daisies and hedgerow plants which already bear the impress of his style. At that time he knew nothing of developing and printing and the photographs were processed by a local Camden Town chemist. Edwin called for them on his way to a party. Vogue fashion shoot, 1930s. The only time Edwin Smith ventured into such territory. Among the guests was Paul Nash who looked over Edwin’s shoulder when he was showing the prints to the donor of the camera. 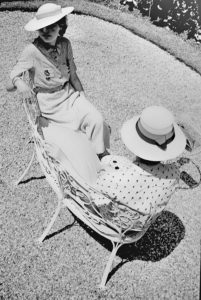 Generously ready as he always was to help the young and attracted by the freshness of these images, Nash not only enabled Edwin to use the darkrooms of Lund Humphries after office hours and thus to learn the grammar of his craft, but recommended him to the editress of Vogue. It was in this periodical, most unsuitably, that in 1935 Edwin’s work was first published. Two of the photographs he took at the Henley Regatta for Vogue are included in this exhibition. Edwin always said the whole episode was the result of a mistake, the editress having wrongly understood his name to be Chetwynd-Smith. As soon as Edwin made it clear that he was just plain Smith the commissions came to an end. But the photographs had been noticed and from then on the demand for them never stopped. 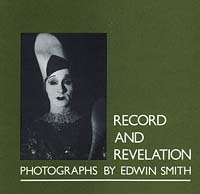 Edwin never once sought work, but without ever having intended it he eventually became an almost full time photographer. The process was gradual and at first it was the publishers of newspapers and periodicals who asked for Edwin’s work, reproducing photographs taken for no other reason than to record a particular visual experience. The fairground and circus photographs shown in the present exhibition represent a major interest of these early years. Between 1935 and 1938 Edwin made a comprehensive record of the exuberant, fantastic world of the fairground and circus, many of the traditional elements of which did not survive the forties. A few of these were used by the press; most of them have never been seen. 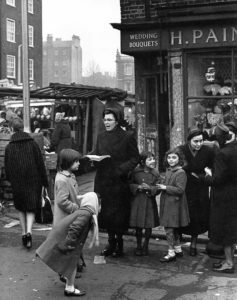 Edwin always had an amused and sympathetic eye for the poetry of the commonplace, for things seen casually in the street, in shop windows, in pubs and in humble interiors and his photographs of these subjects brought him a number of commissions. 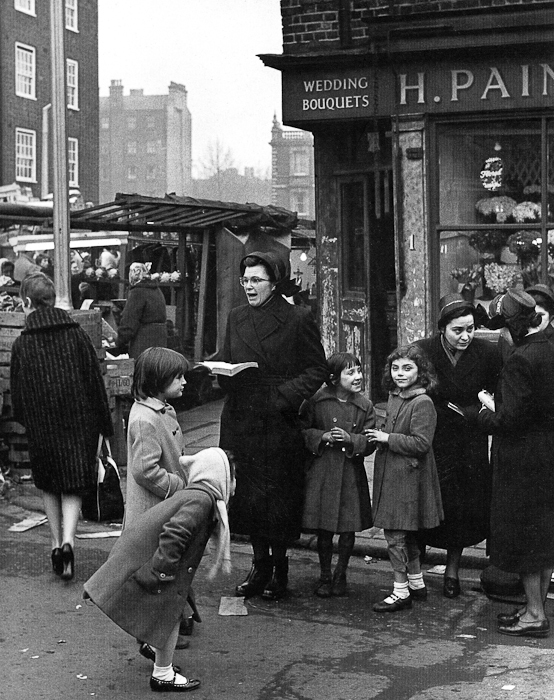 His pictures of the street life, the terraces and shops of Camden Town, where at that time he was still living with his mother in the two rooms in which he had grown up, attracted the attention of Sir Arnold Wilson who in the summer of 1936 asked him to record the lives and work of the Newcastle colliers. One wonders what the patron’s reactions were to the fruits of this expedition, a small selection from which can be seen in this gallery. For the photographs do nothing to confirm Sir Arnold’s political extremism. Edwin’s delight in the Newcastle scene was, as with all his subjects, predominantly visual, kindled, as always, by the timeless, aesthetic qualities of tone, light and rhythm. He photographed the people who were part of this urban, industrial scene without any sense of the ‘concern’ or ‘commitment’ which his patron felt and about which we hear so much today. Through instinct with his warm humanity, affection and humour these images express complete tolerance and acceptance of the situation. Among others who noticed Edwin’s early work was the director of the Focal Press. For him Edwin wrote several books on photographic technique and one of these, entitled, ironically enough for one who never resorted to tricks. All the Photo Tricks, is still being reprinted. Leonard Russell, editor of The Saturday Book was another admirer and Edwin’s long association with this popular annual brought him to the attention of many publishers. Before 1950 photography took up no more of Edwin’s time than two or three days a week at the most. It seemed to offer an ideal solution to the problem of earning a living while leaving ample time for painting and print-making. Edwin’s knowledge of the painting and graphic techniques was astonishing – later he edited two standard works on the subject – and whereas the most makeshift equipment was good enough for the darkroom, only the best was accepted in the studio. Edwin loved all the materials and appurtenances of the painter’s art, always ground his own colours and throughout his life kept a collection of canvases, boards, paper, powder colours, inks, pastels, brushes and pencils big enough to stock a shop. Despite the tremendous pressure of his later years he never ceased to think of himself as a painter and always managed to do at least two drawings every day when he was not travelling. 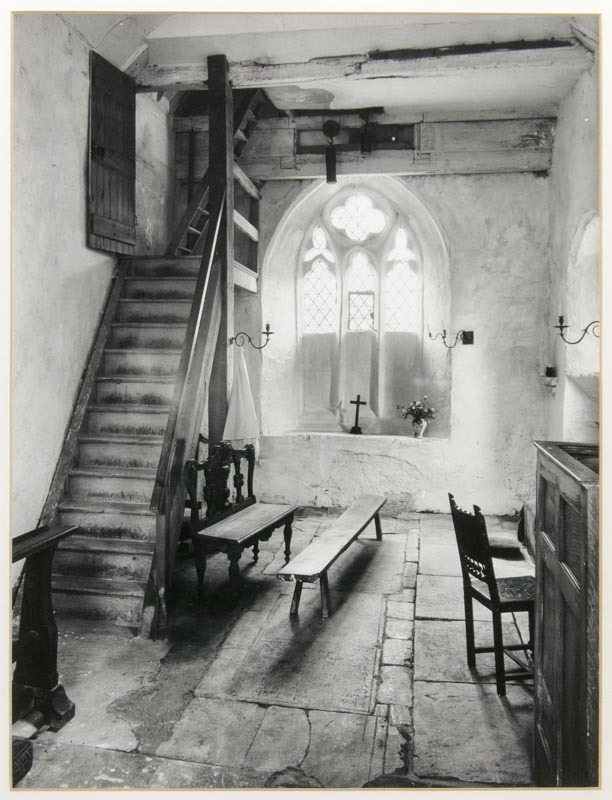 In 1950 Thames and Hudson commissioned Edwin to take the photographs for a big book on English parish churches. The subject was entirely congenial. Twenty years later Edwin said that the village church had given him some of the most poignant visual experiences of his life. He has described his procedure and it is worth recalling, for it remained much the same whenever he was confronting an architectural subject. When Edwin arrived at a church he would dump his equipment behind a pier, under a bench or perhaps under the collecting box table until he was ready to begin work. He was never seen with his camera draped about his person. It was always discreetly satchelled or, if it was the Ruby, carried in a large suitcase. Edwin would spend some time strolling round the outside of the building, then savour the interior, enjoying not only the immediate pleasures of the eye but thinking also of the needs of the camera. Usually he became excited by a number of possibilities and always worked in the lighting conditions that existed at the moment when he decided to start. He never used photographic lamps except for individual works of art and did not possess any until the late sixties. Interiors invariably necessitated the use of a black cloth over the head and exposures which might last from 10 seconds to many more minutes. The passage of the seconds was measured not by a meter, but by a whispered incantation: “Cat one, cat two, cat three, cat four . . .“, while the photographer smiled encouragingly at his subject and, with spectacles pushed up onto his forehead, fixed it with his short-sighted gaze. Perhaps the most remarkable achievement of this use of long exposures in dim interiors was the series of photographs Edwin took in Westminster Abbey at the beginning of 1970. Among them was the jewel-like head of William of Valence which figures in the present selection. So that he should be able to work undisturbed Edwin spent the best part of a night in the great, dusky building, his only companions the effigies of the illustrious dead. It was a thrilling experience, enhanced, when the final prints emerged, by the revelation of details of capital and boss, lineament and dress which eluded the human eye in the full light of day. The Thames and Hudson book was a huge success and from that time Edwin was deluged by commissions for similar books. His work took him all over England many times and to every part of Europe. Such extensive travel was in itself extraordinary, for Edwin never left home from choice and when I first met him had not been away from London for several years. He would set out on a project with great reluctance. Yet once the break had been made he gave himself up to the visual impact of the journey and worked with the utmost dedication. Generally his authors and publishers supplied him with lists of subjects. They often turned out to be ludicrously unpictorial and Edwin would waste no time on them, directing his lens only onto what moved him. He never developed his plates or films until he returned home and thoroughly enjoyed the uncertainty of not knowing, sometimes for two or three months, whether his work had prospered. Nevertheless Edwin’s photographs, like those of every sensitive witness with a lens, are so much more than factual records: they are revelations not only of those hidden details which delighted him but of the magic and mystery with which light and shadow can invest the most commonplace themes and, above all, of his own warm, emotional and transforming response to the visual world. With his special knowledge and love of architecture it was not surprising that his books should earn him a considerable reputation as a photographer of buildings. But it was landscape which finally became most important to him. He had always been stirred by the fleeting effects of light and weather, winds and water which he felt that only the camera could capture. Even with his first primitive camera Edwin took photographs of trees and plants and of patterns shaped by storms, tides and frost. In his Bristol lecture he singled out his landscape photographs as his particular testimony. In them, he said, he had perhaps managed to convey something of infinity.